Cellular Sales' new store in Lake Saint Louis opened on March 8. We have been working on expanding our Midwestern presence, and the Lake Saint Louis location is just one of many new stores in the region. 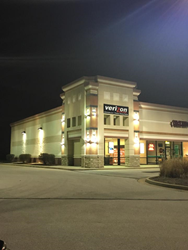 Cellular Sales, the nation’s largest Verizon premium retailer with approximately 550 U.S. locations, has expanded its reach in Missouri with the opening of a new store in Lake Saint Louis. The new store at 6103 Ronald Reagan Drive, by Title Max Loans and El Maguey Mexican and across from the Walmart Supercenter, has been welcoming new customers since it officially opened on March 8. Cellular Sales has rapidly grown since it first opened in 1993 in Knoxville, Tenn. Now, the premium Verizon Wireless retailer proudly operates approximately 550 stores in 28 states across the country. It is widely known for its outstanding customer service, and has been recognized as one of the nation’s fastest-growing, privately owned retailers for seven of the past eight years by Inc. Magazine.